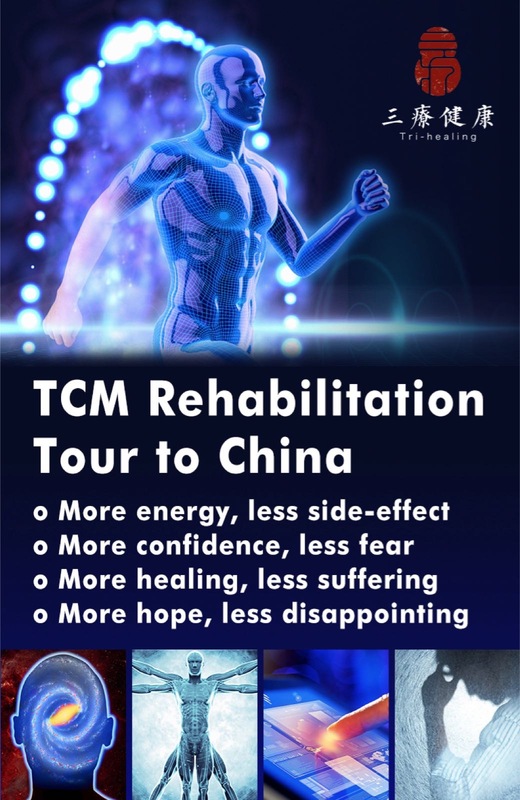 The Science of Qi Healing, is a survey of more than 240 research papers on the science of Qigong, Taijiquan and Qi healing, recently published by Traditional Chinese Culture Institute International, (http://www.tccii.com). In this paper Dr. Nawalinski summarizes the most relevant Chinese and English literature for readers. It is available as a free PDF download with reference citations. Here are a few excerpts and summary of this interesting research paper. The Qi healing arts originate in the Daoist cultivation and medical practices of ancient China. These arts are based, in part, on the use of Qi (vital energy), Yi (intention), and Shen (spirit). 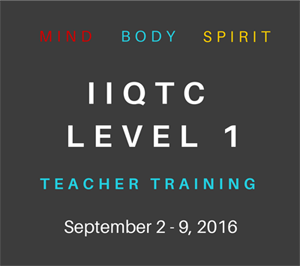 They include the arts of Qigong, Nei Gong, Tai Chi, Nei Dan, and External Qi Healing. Many students of Qigong and Tai Chi begin studying these arts because they have a number of medical problems they hope to heal with them. In China, the healing aspects of these systems have been accepted since antiquity. Western students lack this cultural context and are apt to seek scientific validation of their practice. We are often asked by our Western students, “Is there any scientific evidence for Qigong and Tai Chi health benefits?” This survey and summary of literature was designed to offer an overview on the science of Qi healing, with review of more than 240 English and Chinese studies. The purpose of this summary is to familiarize the reader with the volume of material available and provide a starting point for further research. It is important to note that the information in this publication is for informational purposes only. Please read carefully the DISCLAIMER above and consult with your physician or health care practitioner before beginning any form of exercise or treatment. If you do decide to begin practicing Qigong, Tai Chi or any of the many other Chinese healing modalities, we encourage you to find an art and teacher that resonates with you. These arts are rarely quick fixes. It is often said that these arts are a journey, not a destination. In many cases they require diligent daily practice for an extended period of time before realizing any benefits. For example, in Nei Dan (Internal Alchemy), the highest level of Qigong training, the first stage is only reached after a minimum of 100 days of intense practice. To maintain this level, the student practices every day! Traditional Chinese medicine attributes the origin of Qigong (氣功) to the legendary Yellow Emperor, Huangdi (黄帝) and his classic book of internal medicine, Huangdi Neijing (黄帝内经), about 4500 years ago. However, a Neolithic vessel nearly 7000 years old shows a shaman in meditative and gymnastic exercises associated with early Qigong. In spite of this ancient history it did not become popularly associated with health practices in China until the 1950s. 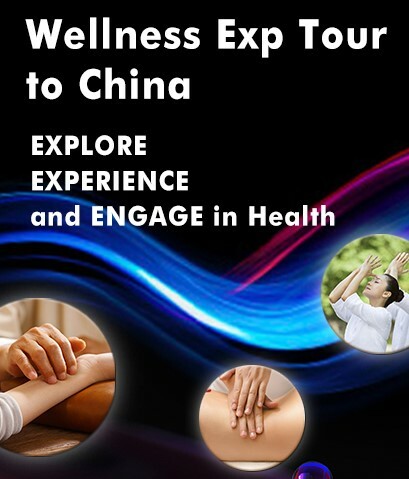 It then unfortunately became a forbidden practice during the Cultural Revolution and not until about 1978 did scientists and health practitioners reestablish Qigong as one of the effective methods to be used in health care for the general populace. Qigong can be thought of as the process through which cultivation of Qi (氣 vital energy) and Yi (意 intent and consciousness) achieve an optimal state of both mind and body. This can be developed with great effectiveness through an individual’s diligent self-practice, consisting of guided movement and static meditation leading to a state of empty mind, or stillness, wherein one senses an expansion of self, a connection with the rest of the universe. But the truly committed student, through long and dedicated practice, may achieve an enhanced awareness of Qi and the ability to guide it toward sites in the body. Highly experienced Qigong healers can direct their Qi outward (external Qi, EQ, or external Qi therapy, EQT，外氣治疗) to help unhealthy individuals balance the energy system in their bodies and begin their own process of recovery. Taiji is clearly related to the postures of Qigong and flows from Qigong’s own ancestral beginnings. It evolved as a ‘soft’ martial application of the development of Qi and is one of three extant internal martial arts (Tai Ji Quan 太极拳, Ba Gua Chang 八卦掌, Xing Yi Quan 形意拳) subsumed under the Qigong umbrella as its martial progeny. Not often practiced nowadays as the potent martial art it is, the gentle postures of Taiji are, instead, done as a health-building exercise by students who may not even be aware of its martial origins. The legendary beginning of the martial art of Taiji Quan (“Quan” = “fist”) is attributed to one Zhang San Feng (张三丰) around 1100 A.D., but the principles were known at least 500 years earlier. Obfuscating the foundation of this art are the facts that there may have been at least two persons of that name; Zhang is reported to have lived in the Sung (960-1279), the Yuan (1279-1368), and the Ming Dynasties (1368-1654); he is reported to have practiced on Dragon-Tiger Mountain (龙虎山 Jiangxi Province) and Wu Dang Mountain (武当山 Hubei Province), several hundred miles apart; and is said to have been taught by god through a dream. There is also a Zhang San Feng recorded in a book of the Ming History, but with no mention of martial arts or Taiji Chuan. We do, however, have clear historical confirmation of a human founder of Taiji in one Chen Wang Ting (陈万廷) (1600-1680), a military general at the end of the Ming Dynasty. 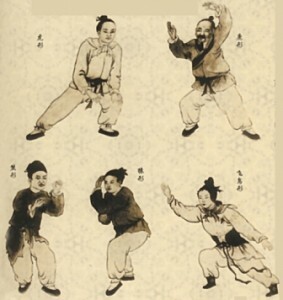 General Chen modified the standard military training of 32 Postures Long Fist of that period, combining it with Chinese Medicine and Taoist Nei Gong (內功 Internal Practice) into what became the beginnings of Chen Style Taiji Quan (陈太极拳), the original form of Taiji Quan. We may think of the health version of Taiji as a linked set of Qigong postures constituting a form practiced for its promotion of serenity, balance, strength, and Qi enhancement. Both of these activities share the practice of deep, abdominal breathing commonly associated with meditation, and which is known to elicit the relaxation response, although different areas of the brain are triggered. Many of the same meditative benefits accrue, as shown by the improvement in cardiovascular parameters, skin temperature changes, and the psychological health of wheelchair-bound elderly who, presumably, were limited in their ability to fully execute the prescribed postures of their Qigong program. Taiji is regularly recommended as an exercise alternative, especially for the elderly, in Sunday supplements, online medical E-zines, in lay magazines geared to that age segment (such as AARP Magazine and Prevention), and even by the US National Institutes of Health (NIH). Always touted are its meditative aspects and the improvement in balance to prevent dangerous falls, which account for some 15,000 deaths annually. Two well-known research papers found that only 4 months of Taiji training in a group of elderly subjects reduced the incidence of falls by over 47%, as well as lowering blood pressure and improving several psychosocial parameters. 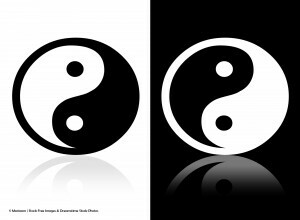 An important review paper documented the benefits of both Qigong and Taiji from research published only in peer-reviewed English-language journals which were cited in the medical literature and which used a randomized controlled trial design. Seventy-seven articles with 6410 participants formed the database for this meta-analysis. From all 77 studies reviewed, physiological and psychological health benefits were identified. These were grouped into nine outcomes: bone density, cardiopulmonary effects, physical function, falls and balance, quality of life, self-efficacy, patient reported outcomes, psychological symptoms, and immune- and inflammation-related responses. The authors conclude that an impressive body of research exists showing that a wide range of health benefits accrue in response to both these meditative movement forms. Since several other papers among the other references listed below combined Qigong and Taiji in assessing health benefits, they were considered to be similar for this present compilation and no attempt was made to separate their combined data; some Taiji-only studies were also included. However, the wise patient makes use of the best characteristics of all healing modalities, including sensible nutrition, adequate and varied exercise, daily quiet time for reflection and renewal, traditional Asian remedies of proven lineage, as well as Western medicine with its ability to rapidly muster biological and technological resources for diagnosis and treatment. The last of these remains the alternative of choice in most acute situations: serious trauma, fulminating infections, accidents, wounds, broken bones, and the like. But the plagues of modern American health are the chronic illnesses cascading from too little attention to the preventive measures above: hypertension, obesity, diabetes, cancer, cardiac and renal insufficiency, musculo-skeletal weakness and pain, Alzheimer’s disease, and the attendant psychological issues of stress, anxiety, and depression. Unfortunately, the U.S. is not alone in this epidemic. Chronic diseases were responsible for 29 million deaths worldwide in 2002; China reports that these diseases account for 85% of the total deaths in that country; in Canada 25% of adults and 9% of children are obese. If we would only structure our daily activities around the sensible practices known to the ancients and to our grandparents to build a healthy base to our lives, much of the armamentarium of Western medicine would lie rusting, and we would only resort to the backup of the surgeon and the antibiotic when the appendix inflames or a lump is discovered. Lives would be fuller, healthier, and happier; budgets would balance; infirm old age would be the exception; terminal illnesses would not linger; the years added to our lives would be anticipated with joy, not dread. With this in mind, the reader must exercise all due diligence – and dare I say obsession – in crafting a healthy and sustainable lifestyle using the preventive measures outlined here as well as common sense and good judgment in what information and practice to adopt or discard. 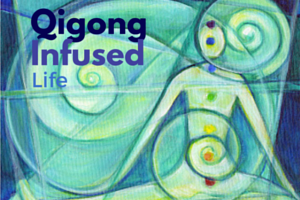 From a Western medical perspective, it is not at all clear how Qigong facilitates the healing process. Some possible mechanisms include the improvement of immune functions,  increasing microcirculation and improving the elasticity of blood vessels,  raising the pain threshold, or regulating the metabolic system through the cerebral cortex and the central nervous and cardiovascular systems. It has been suggested that nitric oxide (NO) acts as an effector molecule to mediate the metabolic functions along the Qi meridians of the body. NO is a gas, diffuses quickly, mediates many important metabolic pathways in the body, and has both healing and toxic properties. NO functions in two important ways: it is a messenger by which cells communicate with each other; and its toxic properties are used by the immune system to kill or slow the growth of invading organisms. NO has been consistently found in higher concentrations in skin acupoints, which themselves are associated with low electrical resistance and concentrations of ionic calcium and cholinesterase as they trace neurovascular bundles. Warm needling of the leg acupoint Zu San Li (St 36) (足三里) in older people produced a significant increase in peripheral blood NO. Microinjection of NO into the brains of rats during electro-acupuncture of the St36 point facilitated the normal hypertensive and brady cardiac effects. The validation of NO as the chemical effector for acupuncture is not yet certain and its role in Qigong even less clear, but it is possible that similar mechanisms work for both since Qigong practice and a needled acupoint targeted to a given organ both produced myoelectricity at other sites along that organ’s meridian. The bulk of research on Qigong and its ability to heal has been done in China, largely within the past two or three decades. The extraordinary medical findings of the early work on this ancient practice has attracted the attention of health care workers, mainly in the United States and Japan, and has inspired more rigorous scientific studies with appropriate controls and statistical analyses to verify the healing capabilities of Qigong as both, a self-practice and as a healing modality in the hands of an external Qi practitioner. This review of the studies on self-practice and external Qigong healing is based on a selection from well over 300 papers. Many were available only in Chinese so summaries by Kevin Chen and Kenneth Sancier were invaluable in making this information available to non-Chinese readers. Other summaries and meta-analyses compiled small reports into meaningful statistics. There are also a few popular reports, as may have appeared in health-care newsletters, online E-zines, and lay magazines. With many recent empirical studies, there is little doubt of the efficacy of Qigong in positively affecting a remarkable spectrum of human ailments. The inclusion of animal models, in vitro studies, and the statistically significant findings in many of these, support the argument that Qigong represents a healing modality that deserves serious consideration for daily use as the base for a sound health program as well as a supplementary aid in conjunction with conventional Western therapy when that becomes necessary. Undoubtedly the reader will be most interested in those studies directly involving human beings and their diseases. The inclusion of work involving inanimate objects or cell cultures or laboratory animals may seem unimportant compared to those on sick people, but their inclusion in this review is vitally important to support what might rightly be considered the more relevant works. Cell cultures and mice are not subjected to a placebo effect as might be human patients so they may, in fact, be a more credible testament to the efficacy of the power of Qi than would a human subject susceptible to the influence of suggestion or wishful thinking. Several papers in this review of the scientific literature specifically addressed the benefits of Qigong practice and EQT for both healthy and infirm elderly, but popular articles also appear almost weekly in newspapers and magazines. They universally encourage practicing Qigong and Taiji for their health-promoting activities in building lower body strength, improving balance, and reducing stress. And, in general, CAM users were significantly more likely to rate their health as ‘excellent’ and ‘better than last year’ than did respondents who did not use CAM. The specific benefits commonly observed in those individuals who practice regularly included things such as a reduction in pain, anxiety, and depression; improved balance; improved muscle strength and physical functioning; enhanced immunity; reduced joint stiffness; lower blood pressure; improved cognitive functioning (a Taiji study); reversed symptoms of aging and longer lives – all of which directly or indirectly improve the quality of life these seniors enjoy. In a study of hypertensive patients, Qigong exercise improved several blood chemistry parameters and increased mean levels of the anti-aging enzyme, superoxide dismutase; their prescription drug dosages could be decreased; and their blood pressure, immune response, cholesterol, and bone density all improved. This same review noted a study of 158 patients with cerebral arteriosclerosis who experienced improvements in memory, dizziness, insomnia, tinnitus, numbness of the limbs and vertigo headache after only one to six months of Qigong practice. 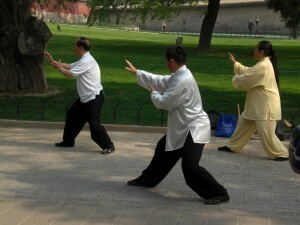 In a study of 100 patients, either presenile or with cerebral functions impaired by senility, six months of Qigong practice produced improvements of 80% or more in eight of the fourteen main clinical signs and symptoms; control groups that either walked, walked quickly, or ran slowly instead of practicing Qigong improved in none of the symptoms more than 45%. Rheoencephalography showed that blood flow to the brain was increased during Qigong exercise. In one study of pain the analgesic effect persisted for six months after the trial ended. However, long-term chronic conditions may not resolve, as shown in a study of neck pain in elderly patients where there was no significant difference between Qigong and regular exercise groups. A similar study of neck pain which had persisted an average exceeding three years found a benefit with Qigong practice over the no-treatment controls, but it was not statistically significant. Everyone starts somewhere. It begins when you decide to step out on your journey of self-discovery and self-healing. For some, taking control of their health may be simple. For most of us, we will have to work to “awaken the sleeping dragon.” It lies, waiting for the call of our intent, to stir and grow with resolution, persistence, and patience. Download the entire paper in PDF format. 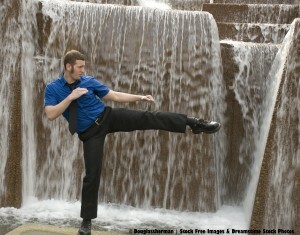 TED NAWALINSKI, Sc.D., has more than 36 years’ experience in Chinese Internal Kung Fu, Tai Chi, Qigong and meditation. For the last 15 years he has devoted most of his attention to Taiji, Qigong, and the healing properties of foods and meditation. His classes with elderly people in the western suburbs of Philadelphia offer a holistic approach to wellness, with nutrition and exercise advice to complement the movement and breathing of Taiji. Ted is a lifelong biologist and brings a global perspective to his interest in fitness and health. Yang JW. Advanced Yang Style Tai Chi Chuan: Vol One: Tai Chi Theory and Tai Chi Jing. 1991. YMAA Publ Center. Jamaica Plain, MA, USA. Wan ZC, Chan GX, Fang WZ, et al. 1990. A Preliminary Observation on the Effect of Qigong Waiqi on the Function of Making Blood. Proc 3rd Natl Acad Conf on Qigong Science, Guangzhou. Wang JS, Li DZ, and Zhao JZ. 1989. Experimental Study of Compound Analgesia by Qigong Information Treating Instrument and Acupuncture. Proc 2nd Intl Conf on Qigong, Xi’an. Chen K and Yeung R. 2002. Exploratory Studies of Qigong Therapy for Cancer in China. Integrative Cancer Therapies, 1(4):345-70. Marletta MA and Spiering MM. 2003. Trace Elements and Nitric Oxide Function. J Nutr, May;133(5 Suppl 1):1431S-3S. Ma SX. 2003. Enhanced NO Concentrations and Expression of Nitric Oxide Synthase in Acupuncture Points/Meridians. J Altern Compl Med, Apr 9(2):207-15. Wei H, Huang CL, and Kong J. 1999. The Substrate and Properties of Meridians: A Review of Modern Research. Acupuncture Med, 17:134-9. Li S, Chen K, Wu Y, Jiao J, and Tao L. 2003. Effects of Warm Needling at Zusanli (ST 36) on NO and IL-2 levels in the Middle-Aged and Old People. J Tradit Chin Med, 23(2):127-8. This entry was posted in Scientific Qi Exploration and tagged Elderly, Martial Arts, Qi, qi healing, Qigong, tai chi, taiji, the sceince of qi healing, Western medicine. Bookmark the permalink. I look forward to Part 2 of the article!